The decision to replace existing motors with newer premium efficiency motors can be difficult. And, a common mistake made is thinking that buying any new premium efficiency motor will deliver optimal efficiency. This paper discusses how to determine whether to rewind or replace a motor, and how to find the right motor size for the application. This new White Paper explains the three basic standards of motor efficiency: pre-EPAct, EPAct, and Premium Efficiency (also known as NEMA Premium). It also contains considerations for determining when rewinding the motor’s coils may be the better option over replacing the motor. Likewise, considerations are given to determine when motor replacement is the better option. 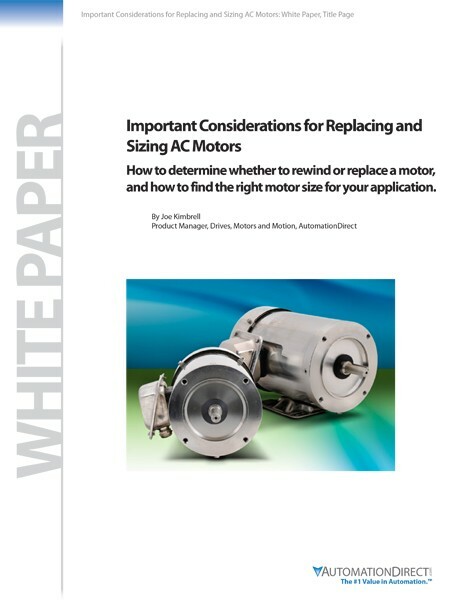 This White Paper also provides important factors when selecting the proper size replacement AC motor. A too-frequent problem in today’s industrial applications is the use of oversized motors. The paper explains that this issue is easily addressed with more precise up-front engineering, such as conducting a motor survey to correctly size a replacement motor. The Important Considerations for Replacing and Sizing AC Motors White Paper can be downloaded as a PDF here. To download other White Papers, click here.